Kansas, a state that went for President Donald Trump by 20 points two years ago, on Tuesday turned one of its four Republican seats in Congress to Democrat. Democratic newcomer Sharice Davids topped incumbent Republican Kevin Yoder in his quest for a fifth term. She beat the Kansas City-area 3rd Congressional District by roughly 9 percentage points. Another political newcomer, Steve Watkins, was elected to replace fellow Republican U.S. Rep. Lynn Jenkins in the 2nd Congressional District that covers most of the eastern third of the state. He edged out Democrat and former Kansas House leader Paul Davis. In the Wichita area, incumbent Republican Rep. Ron Estes won re-election over attorney James Thompson, the same Democrat he beat in a special election last year. And Republican U.S. Rep. Roger Marshall won another term in the sprawling western Kansas 1st Congressional District, again beating perennial opponent Democrat Alan LaPolice. Davids became one of the few Native Americans, and perhaps the first American Indian woman, elected to Congress. Davids and Yoder clashed over immigration, as much as anything . Davids was criticized early in the contest for a podcast appearance where she seemed to call for the abolition of U.S. Immigration and Customs Enforcement. She later walked that back, insisting only that the agency needed reform. Likewise, Yoder vastly overstated the number of immigrants filing false claims in seeking asylum. He also waffled at times on various immigration issues — at one point this year siding with Democrats on asylum issues, then later joining ranks with the Trump administration. The two also differed sharply on health care issues. Yoder voted with other Republicans time and again in opposition to the Affordable Care Act, commonly known as Obamacare. For a time, that served him well in his Republican-leaning district. But after Trump took office, Obamacare became increasingly popular. Davids made it a centerpiece of her campaign. At the Davids party, the room was boisterous when the cable networks began calling the race for her, another seat shifting to Democrats in their hopes of wresting control of the House from Republicans. They did. This Kansas district — a mix of largely white and wealthy Johnson County and more diverse and less prosperous Wyandotte County — sent a one-time mixed martial arts fighter and openly lesbian attorney to Washington. Across town, the Yoder party began to thin out early, many supporters uninspired by never-say-die backers of the incumbent and a band playing “Lukenbach, Texas.” Yoder had won the seat four times, always by fairly comfortable margins. Yoder wished Davids good luck and called for unity but said the raise-money-and-run-again merry-go-round of American politics is a problem. “This perpetual campaign cycle must close,” he said. The district is again returning to Democratic hands. Dennis Moore served several terms before retiring amid mounting health problems and his wife later lost to Yoder. Watkins emerged from a crowded and bruising primary, where his opponents directed criticism at him that was uncharacteristic of attacks within a party. But he brought an impressive resume to the race. Watkins is a West Point graduate and combat veteran of Iraq and Afghanistan. His campaign stumbled in the general election when reporters discovered that he exaggerated, or invented, business and philanthropic accomplishments. Davis appeared to be a formidable opponent. While he’d lost a bid for governor in 2014, he won within the 2nd District. But that was a race for state office, where Kansans are far more willing to vote for Democrats. In federal races, Republicans tend to enjoy an advantage. Watkins gave the usual round of thanks for family and campaign workers, but the congressman-elect also mentioned those he’d known in the military academy and in combat. They, he suggested, would appreciate another victory in life. “I’ve lived to fight another day,” he said. Davis said Tuesday’s loss marked the end of his political career. He chose to look at Kelly’s victory as the silver lining to his cloudy day. 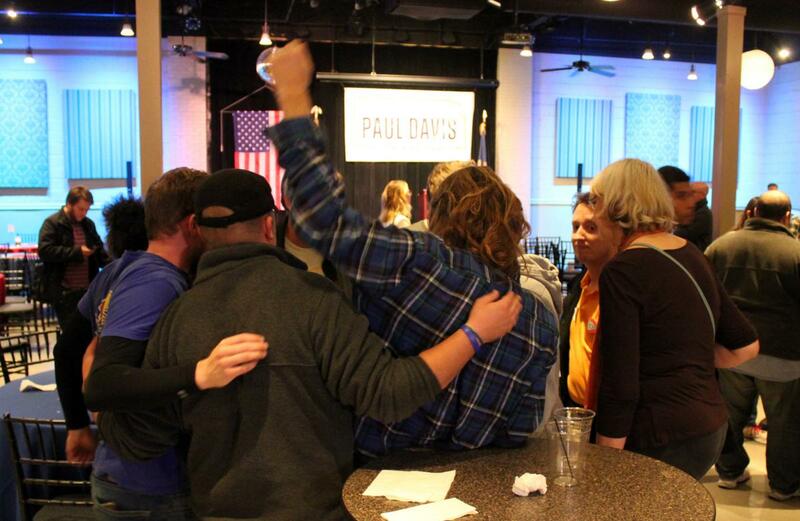 Davis supporters after their candidate conceded the congressional race Tuesday night. Brian Grimmett, Stephen Koranda, Sam Zeff, Nomin Ujiyediin and Frank Morris contributed to this article.